There are currently 3,371 users on this website. Is there a Scott catalog number for the stamp on right missing the Red ink on printing? Well, that's not the only difference. Stamp on right has "PTA" at bottom, stamp on the left does not. Are these different issues? The stamp on the left has the PTA, but it's partly effaced. Not sub listing for color error. They're not "the arms of Juan Carlos I", but those of Spain after 1977. Imo it's just a red colour f�ding. If it was red colour missing, the spaces suposed to be red, should have been white, which is not the case. I thought is was not a missing red overprint however I looked closely at the correct stamp on left as well as the other eight examples I have and the red is printed on top of the yellow. So I am certain it is not fading. If the red is not faded/bleached, then why is the yellow darker in the areas where the red was printed over it? All the colors are slightly more vibrant in the "error" stamp, in my opinion. Red-missing stamps are the most common color missing error candidates we see here. Red is at the end of the visible spectrum - we all learned the ROYGBIV in grade school. Red is the most susceptible color to sun-fading. 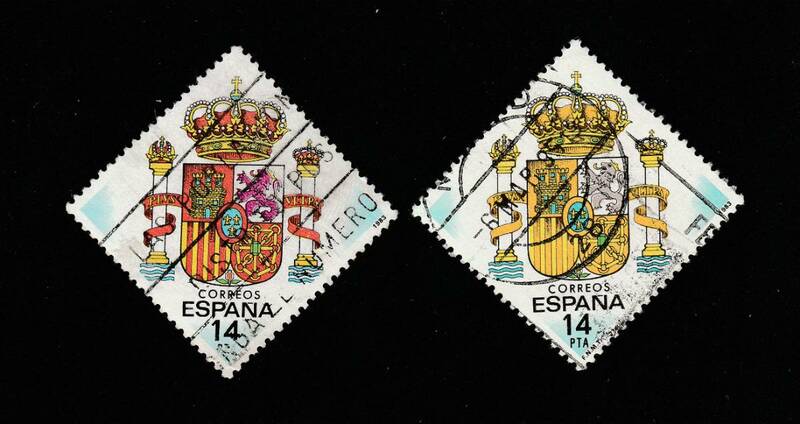 Used stamps are also more problematic to "prove" color-missing varieties. Who knows what the stamp has been exposed to during the past 36 years. Almost any red-missing used stamp will be hard to get a good certificate for. It has a very high likelihood of being a changeling due to light or chemicals. Try to get a good certificate if you think this is a true color-missing error. I'm with John Becker, that stamp has been given sunstroke. It took 0.61 seconds to lick this stamp.